The M.Sc. in Global Business Management is geared towards students with a bachelors degree, with or without professional experience. It offers an understanding of economic and human management in today's global and fast-moving environment. It provides a high level and innovative education to enable students to acquire skills and discipline for positions as managers in the service sector or in a wide spectrum of other industries. The M.Sc. 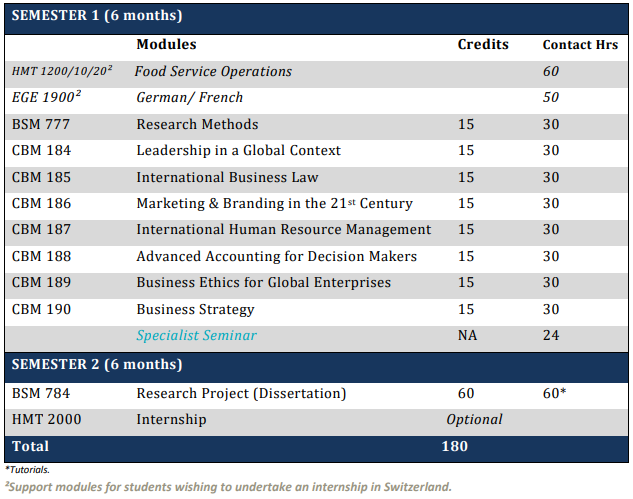 in Global Business Management consists of an intensive, taught semester of 6 months at the BHMS campus in Lucerne, Switzerland, and a second semester during which time students will undertake their research project/dissertation. During this second semester, students may choose to complete an internship in Switzerland or abroad and add invaluable experience to their profile. The award is validated by the Robert Gordon University, UK. Students will thus learn within a Swiss environment, which maintains its world-class reputation in the hospitality industry and receive a final award from one of the UK’s top-rated Universities with whom BHMS has a long-standing relationship. BHMS is a member of the Bénédict Education Group of schools, founded in 1928, whose mission is to provide adult education for people with a desire to succeed. Bénédict School is one of Switzerland’s largest private education organizations and is teaching each year more than 15,000 full and part-time students. Students learn from a dedicated faculty, who in addition to their academic credentials, bring know-how and experience in the hospitality and business fields. This ensures that what is learned in class is contemporary and can be applied in a daily business environment in real-world situations. communicate effectively, with colleagues and a wider audience, in a variety of media. The program offers students a robust academic education, and, if choosing to undertake a hospitality internship in Switzerland, vocational core competency and transferable skills which are invaluable in any future career path. This carries considerable value and prestige with employers worldwide. Students learn food service systems, an extensive range of business management applications, foreign languages, and leadership skills to name a few of the academic disciplines. Throughout the program, Swiss virtues, such as discipline, punctuality, ethics, and hygiene are encouraged as they are highly valued. Depending on students’ prior experience, language skills and professionalism, a variety of placements across the core functional areas of the hospitality industry may be undertaken during stage 2 of the program. This will provide students with invaluable service industry experience and transferable skills, vital to so many industry sectors. The industry training salary in Switzerland, negotiated between the employers’ association and the Employee Union, is presently set at minimum CHF 2’396 per month gross. From this salary, students have to pay for room, board, and taxes. The average net income per month varies from CHF 1’200 to 1’400. Monday to Friday from 09:00 to 12:00 and from 14:00 to 17:00, Saturday courses may be offered in some terms from 11:00 to 17:00. Monday to Friday from 09:00 to 14:00 or from 15:30-20:30. Students should plan for up to 20 hours of homework and preparatory reading per week. As part of their program, M.Sc. students have the opportunity to participate in a dedicated themed seminar offered over 2-3 days during a break week. The seminar program comprises industry speakers and an industry excursion. Students receive a certificate upon completion. Each specialist seminar course comprises 15-20 hours of guest speakers, industry excursions, and practical applications. Certificates of completion are issued at the end of the academic semester. Students are required to undertake a capstone research project or dissertation in their second semester, alongside an optional internship to complete their final Master’s credits. This allows students to develop and present an in-depth, critical research on a hospitality topic of their choice. February, May, August, and November. Please contact the BHMS admission office for the next intake opportunity. Are scheduled according to the holiday plan of BHMS, and can be downloaded from the BHMS website under ‘School Calendars’.